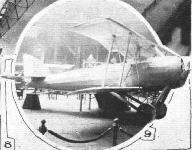 The Breguet "Sesquiplan," type "19 A.2," is a "Grande Reconnaissance" two-seater fighter, constructed of metal throughout except for the wing covering. Tail skid, rudder-crank, etc., of the Breguet "Sesquiplan." The interplane struts of the Breguet "Sesquiplan," are forked at the ends to meet the two wing spars. 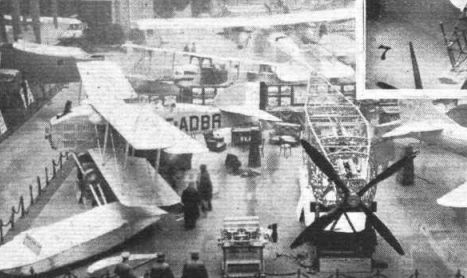 THE PARIS SALON: Farman Goliath. Side view of the Breguet "14T bis." The De Havilland "32" commercial biplane, 360 h.p. Rolls-Royce. 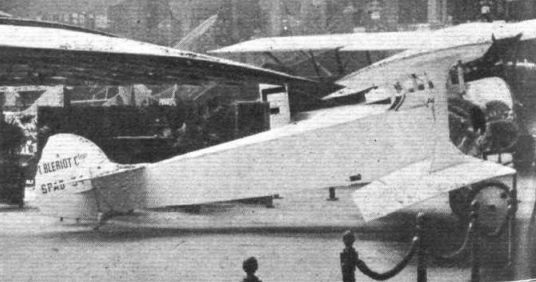 THE HANDLEY PAGE W8. - Our photograph shows this machine, which has two Napier "Lion" engines, starting off for its first flight to Paris, which was made in two hours five minutes. The Vickers "Viking" Mk.IV Amphibian flying boat (Napier "Lion"). 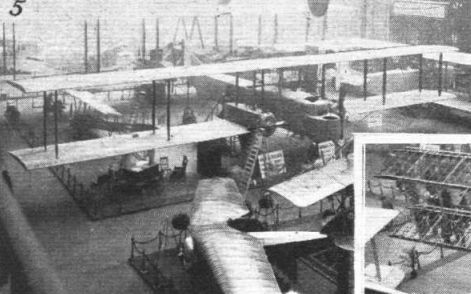 THE VICKERS-VIMY-COMMERCIAL, TWO NAPIER "LION" ENGINES: The identification letters on this machine are "F-ADER." The Vickers "Vimy" transport (two Napier "Lions"). 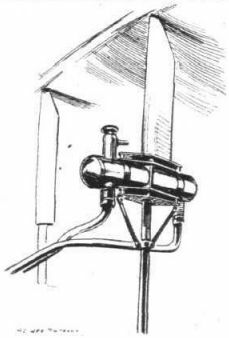 Header tank, mounted on the strut. 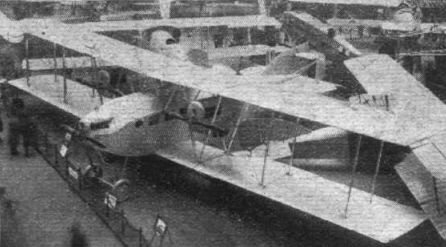 One of the Supermarine "Channel" type machines (160 h.p. Beardmore engines) flying. 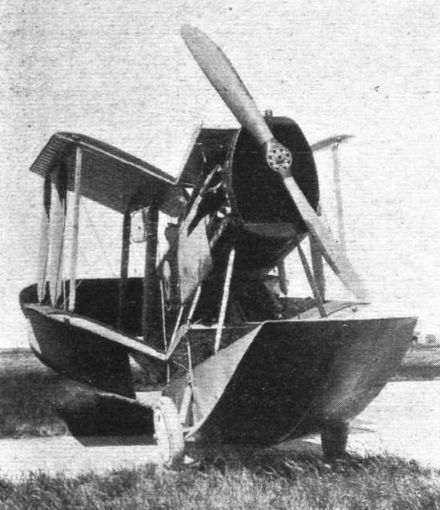 THE PARNALL "PUFFIN": Front view. 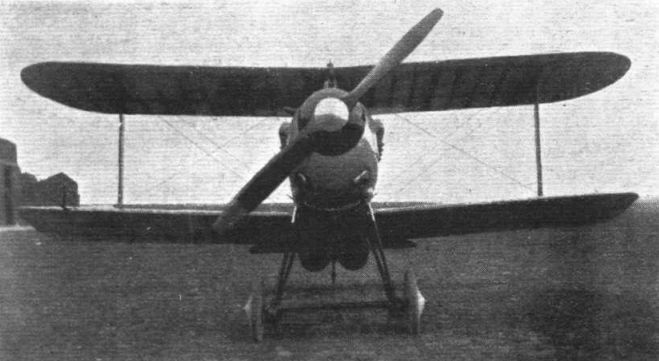 THE PARNALL "PUFFIN": Front view of the machine with wings folded. 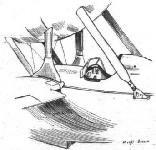 The large angle of the planes when folded is due to the pronounced stagger. Note the amphibian gear working in a slot in the main float. 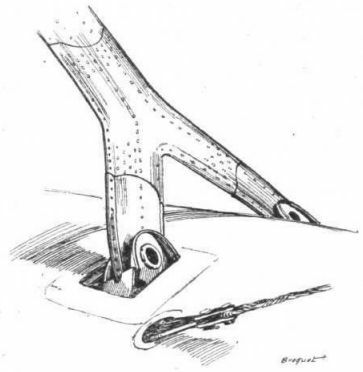 The wing spar attachment on the end of the wing roots of the Ansaldo "A.300T." Side view of the Ansaldo "A.300T." 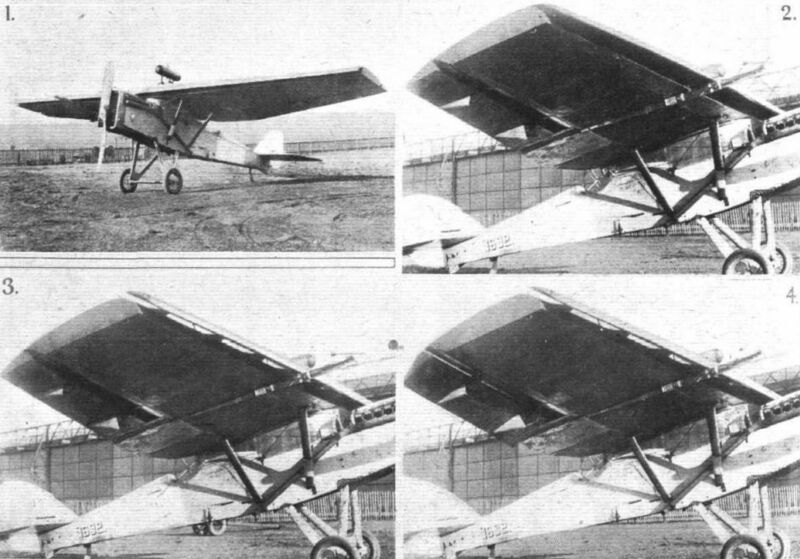 THE HANDLEY PAGE SLOTTED WING TESTED AS A MONOPLANE: 1. The complete machine. 2. Slot closed and aileron normal. 3. Slot open and aileron normal. 4. Slot open and aileron down. 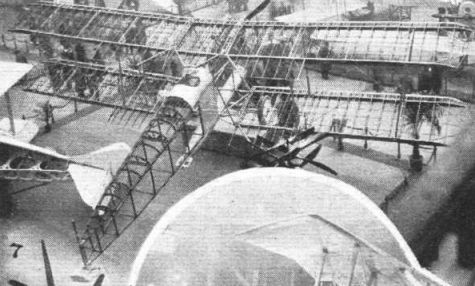 The photographs show a Handley Page slotted wing mounted on the fuselage of a D.H.9A. The machine is comparatively crudely made, but it has served to demonstrate that the scale effect is normal for a slotted wing, and also that the slotted ailerons fitted are effective up to the angle of maximum lift. A more refined machine is now being built, and the full-scale experiments will then be continued with the latest forms of slots. 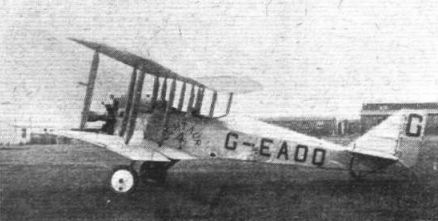 The Avro "Baby," fitted with a 35 h.p. Green engine. The 35-40 h,p. 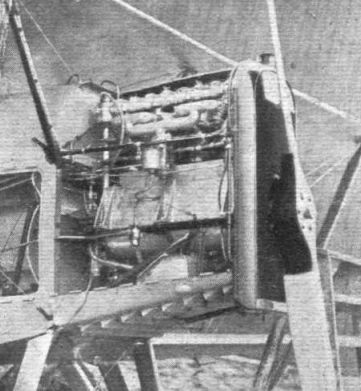 Green engine, installed in an Avro "Baby" biplane. The Blackburn "Swift" torpedo 'plane, fitted with a 450 h.p. Napier "Lion." The Bristol 10-seater commercial biplane, fitted with a Napier "Lion." 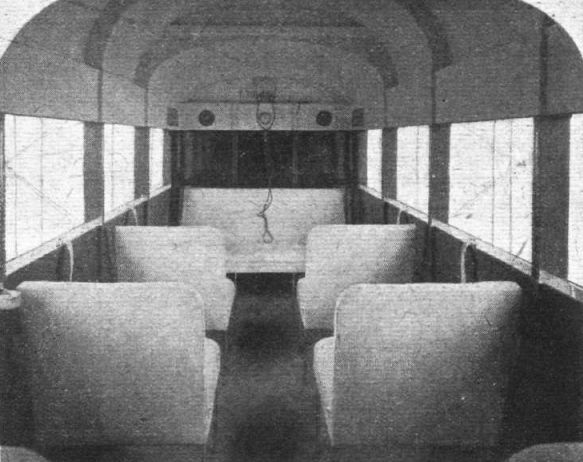 The Cabin of the "Bristol" Ten-Seater: Although not including all the seats, this photograph gives an excellent idea of the roominess of the cabin and of the good view obtained through its windows. The machine, which has a 450 h.p. 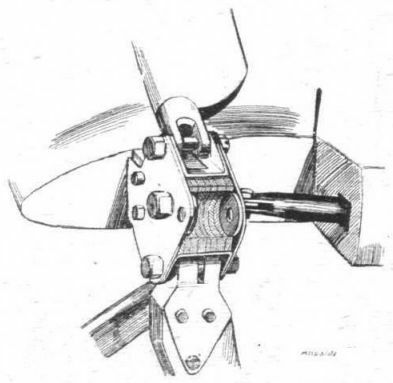 Napier "Lion" engine, was fully described in our issue of July 7, 1921. A FAIREY AMPHIBIAN: The photograph of the machine just after alighting shows the trailing edge of the wings pulled down to give greater lift. This hinged trailing edge is a feature of all Fairey seaplanes. TWO VIEWS OF THE FAIREY "PINTAIL": This machine is an amphibian with Napier "Lion" engine. THE PARIS SALON: F.B.A. (flying boat hulls). Central Aircraft machine. The "Centaur" 2A, 320 h.p. (two 160 h.p. Beardmores), eight-seater commercial biplane. The British Deutsch Cup Challenger: The Mars I, designed by Mr. H. P. Folland and built by the Gloucestershire Aircraft Co. of Cheltenham, was fitted while at Etampes with Lamblin radiators. The result was an increase in speed of several miles per hour, and but for the fabric stitching failing, this machine would undoubtedly have given an excellent account of itself in the race. Incidentally, what about adapting this type of machine for military purposes? With slightly larger wings, so as to improve the climb and reduce the landing speed, it should prove a formidable rival to existing types. 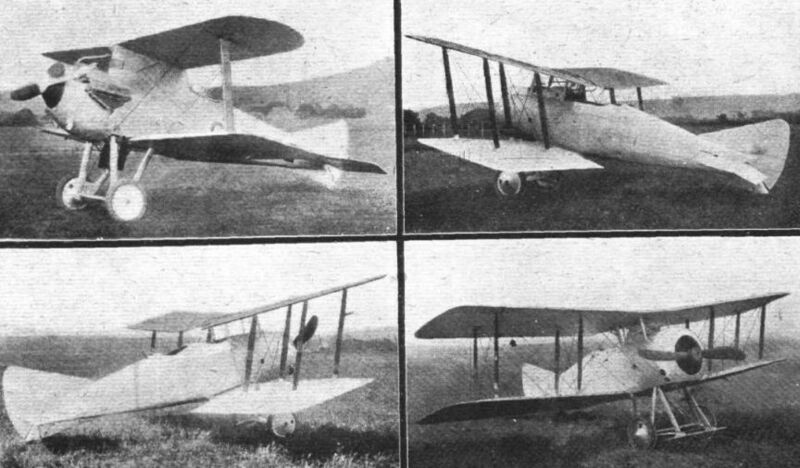 Four types of the Gloucestershire Aircraft Co.'s products. Reading from left to right: Top, the "Mars I" (450 Napier "Lion") racer and the "Mars II" (230 B.R.2) fighting scout; bottom, the "Mars III" (230 B.R.2) training machine and the "Mars IV" (230 B.R.2) fighting scout, ship's 'plane. THE PARIS SALON: Pierre Levasseur. The Supermarine "Seal" Amphibian flying boat (450 h.p. Napier "Lion"). 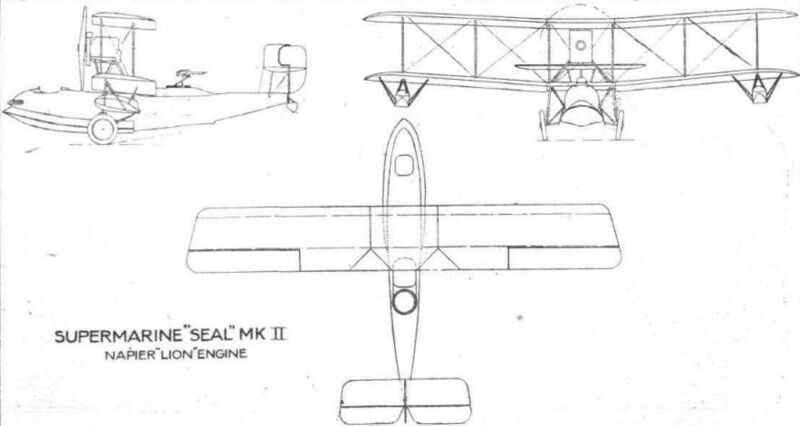 The Supermarine "Seal": Front view of the hull and centre-section, showing amphibian gear. The Supermarine "Seal": The machine coming on to the slipway. The wheels have not yet been lowered. 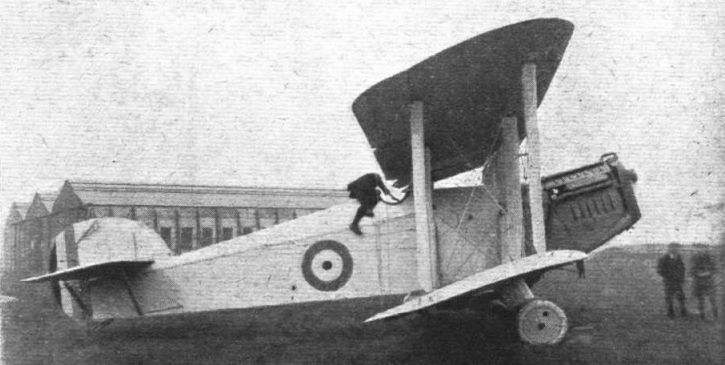 The Supermarine "Seal": View of the machine taxying. Note the wheel well clear of the water. THE WESTLAND "WALRUS" FLEET SPOTTER: Three-quarter rear view. 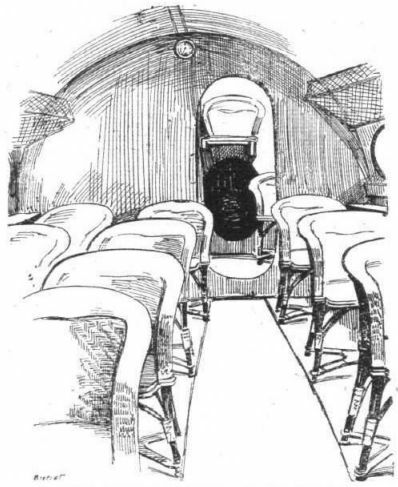 The projection under the fuselage is a chamber in which the observer can lie down so as to get an uninterrupted view of a wide area of the sea. 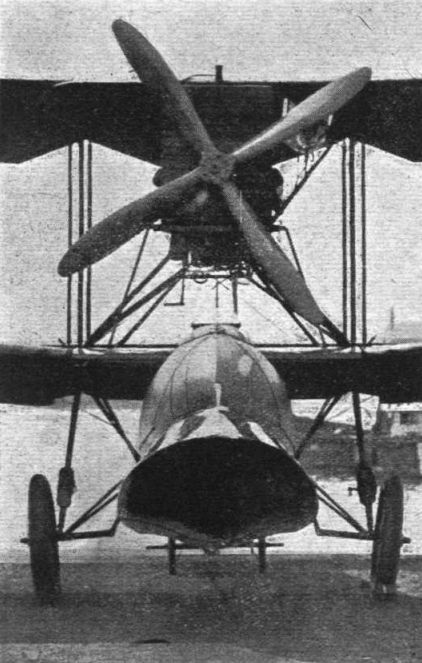 THE WESTLAND "WALRUS" FLEET SPOTTER, with Napier "Lion" engine: Three-quarter front view. 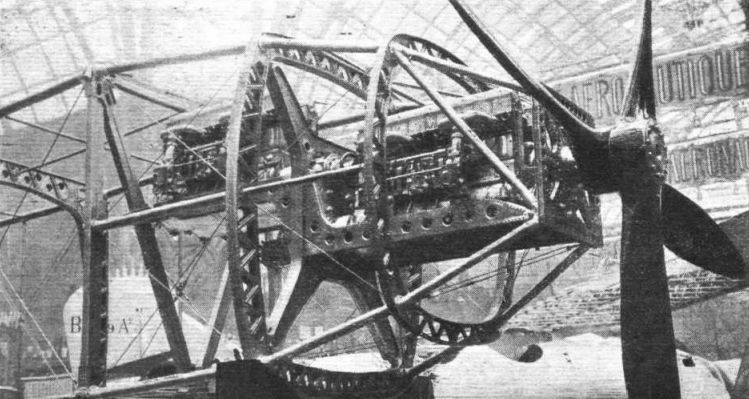 The photograph shows the machine fitted with the "Grain" type of flotation gear. THE PARIS SALON: Nieuport Astra. 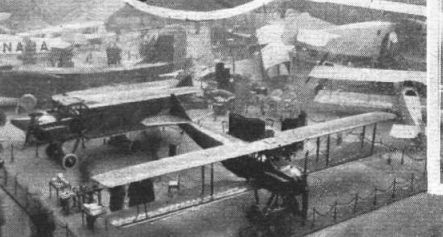 THE PARIS SALON:The small Ricci Triplanes. 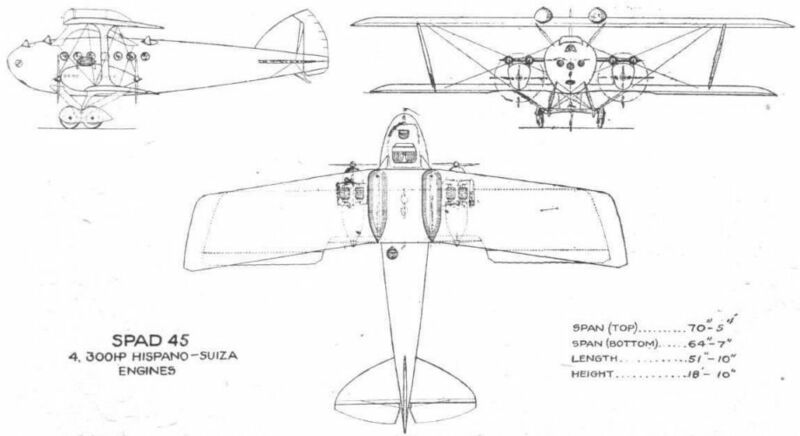 MARTINSYDES FOR SPAIN: One of Martinsyde F.4a (300 h.p. 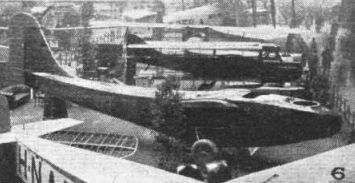 Hispano) two-seater biplanes recently supplied to the Spanish Government. A representative of the Spanish Government was at Brooklands, and made a trip in each of the machines before taking delivery. Front portion of the fuselage of the all-metal Breguet "Leviathan." THE PARIS SALON: Breguet Leviathan. THE PARIS SALON: Rene Tampier. 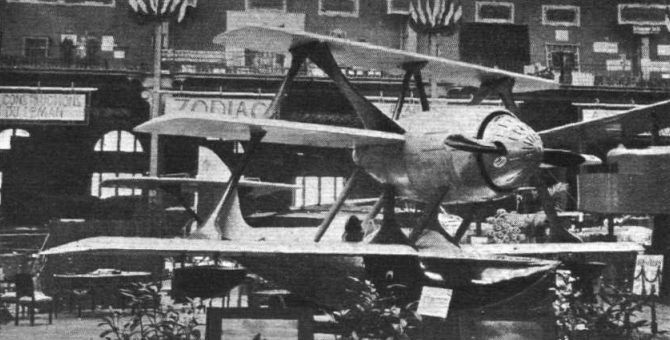 THE PARIS SALON: One of two large three-engined machines, the Potez. 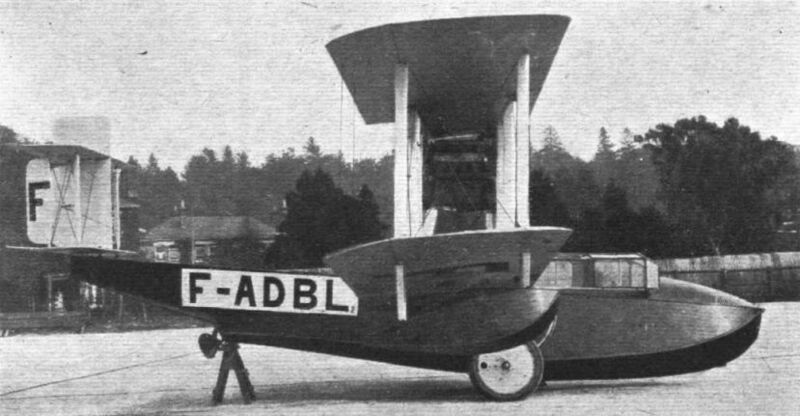 The Marcel Besson single-seater flying-boat type "H.6." 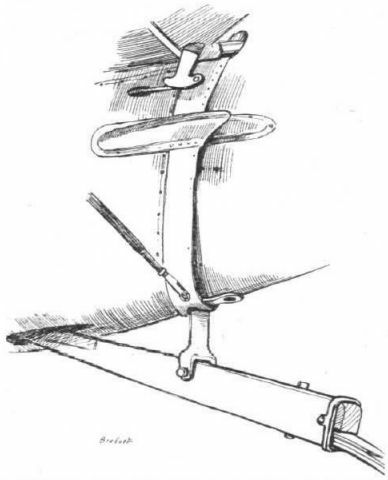 The tail plane of the Marcel Besson flying boat is supported on a single ''leg-o'-mutton" strut. 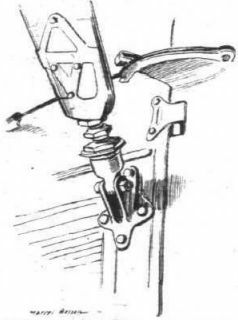 The sketch shows the adjustment. Sketch of the engine struts and cockpit of the Marcel Besson flying boat. 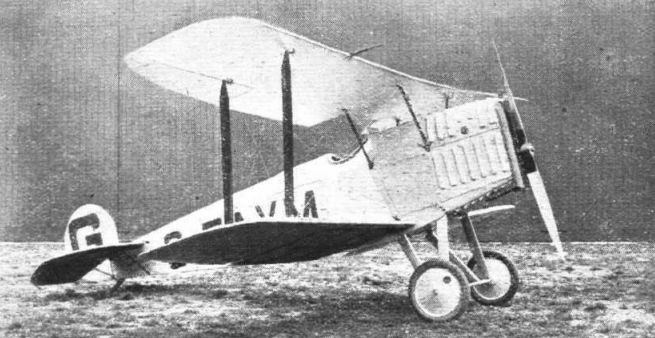 THE SPAD 45: Fitted with four 300 h.p. Hispano engines, this machine carries a crew of three and seventeen passengers. 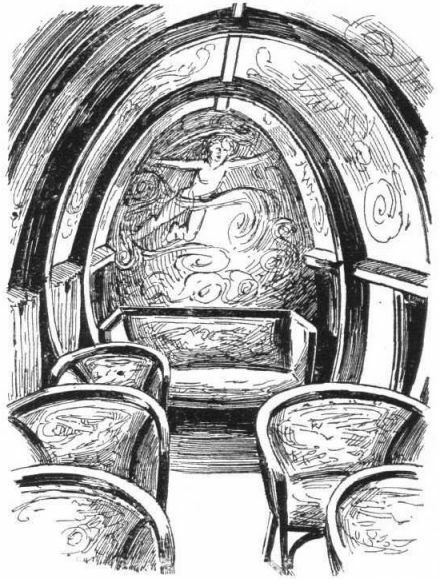 View inside the cabin of the Spad 45. 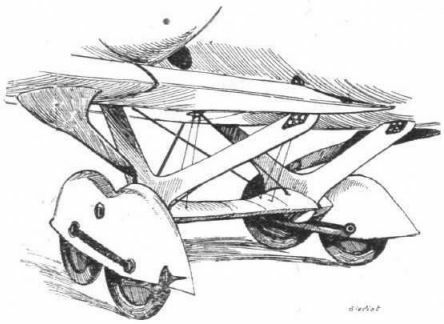 The undercarriage of the Bleriot four-engined machine. An aileron crank inside the wing of the four-engined Spad 45. THE SPAD 34 : This machine is a side-by-side, dual control school machine, with 80 h.p. Le Rhone engine.